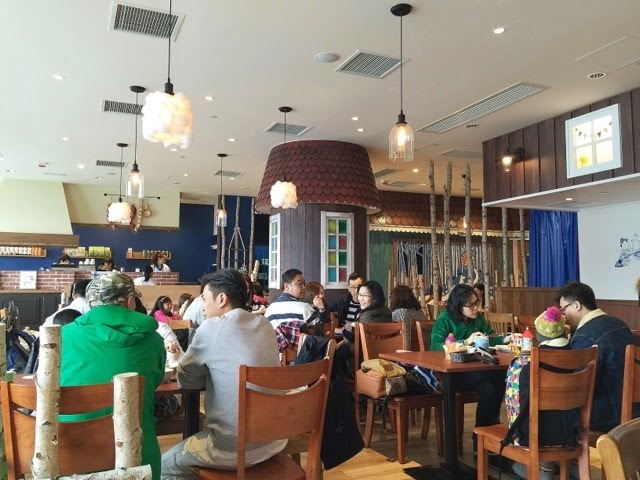 Hong Kong's Moomin Cafe opened in Dec 2014 with a novel concept, and has gone on to enjoy resounding success. This place is now a household name, and well-loved by locals and tourists alike. 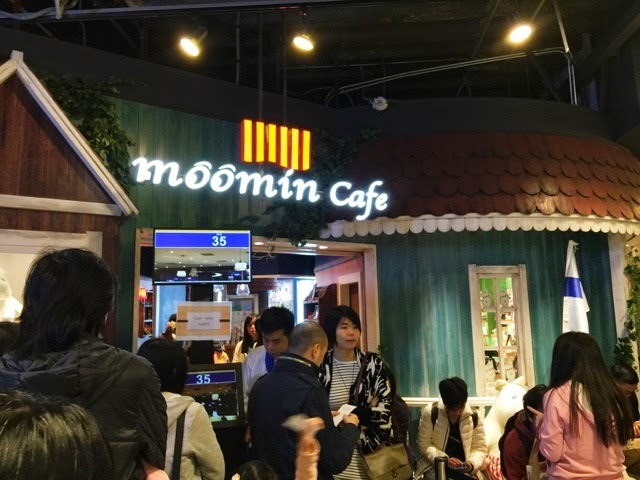 Just what is this revolutionary concept that has drawn droves after droves of eager customers to Moomin Cafe? The answer is as surprising as it is simple — dining with plush toys. This magic formula is what caused us to endure 1.5 hours of waiting before we were finally seated. 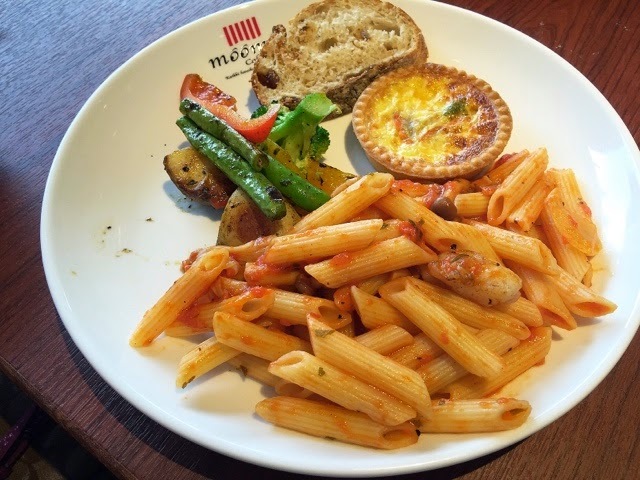 Thankfully, the cafe is nestled within a giant complex of three interlinked shopping malls, allowing the hours to flit by relatively quickly! I love the liberal use of natural light to illuminate the cafe. In addition, diners get a majestic view of the harbour and the city skyline. 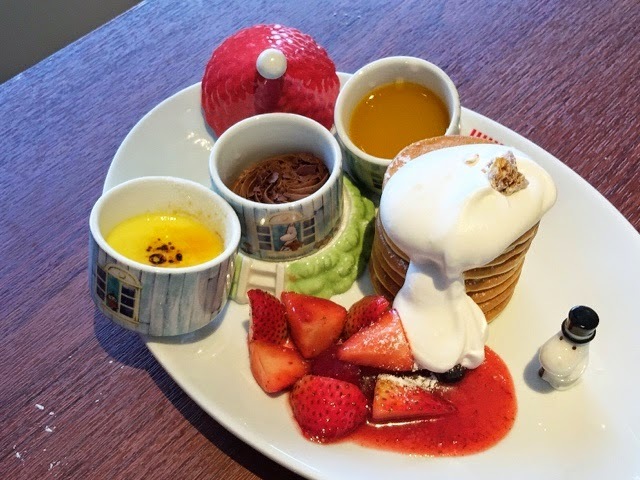 These cute-looking pancakes aren't just pleasing to the eye, they also taste wonderful! 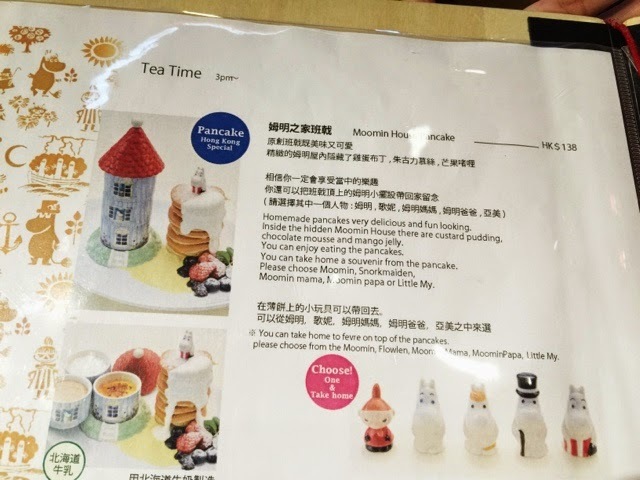 Adding to the appeal is the fact that this item is unique to Moomin's Hong Kong outlets — you can't find it in overseas franchises! Nestled within the Moomin House above lies three types of tantalising desserts. The three sweet gems are the custard pudding, chocolate mousse and mango jelly, each distinctive and delectable in its own way. You also get to take home a dainty souvenir served with each order! 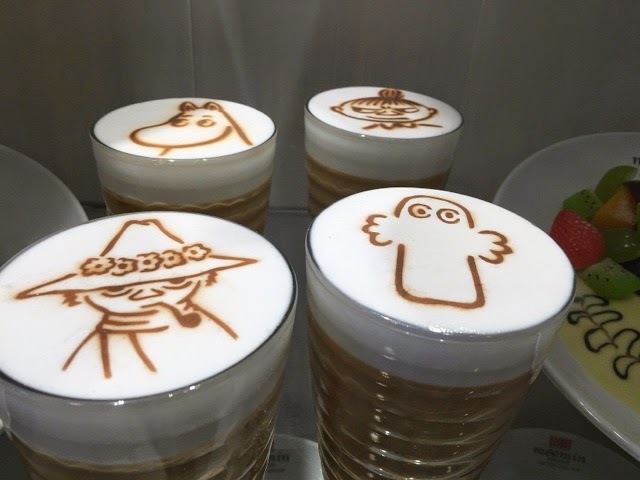 (see bottom right corner of the picture above) Diners can select from the following characters: Moomin, Flowlen, Moom, Mama, Moomin Papa or Little My. 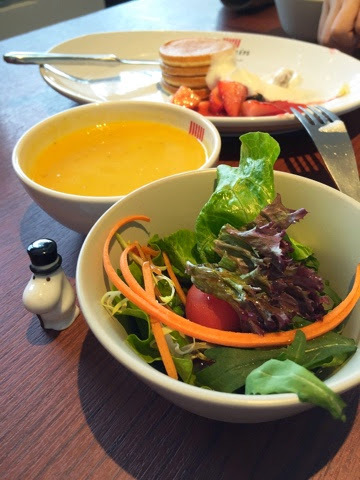 You can select one of three dressings to go with your complimentary salad — Japanese vinegar, Thousand Island and yuzu. Alas, the leaves in the salad didn't seem fresh, and the Japanese vinegar dressing was too sour. I didn't quite fancy this! 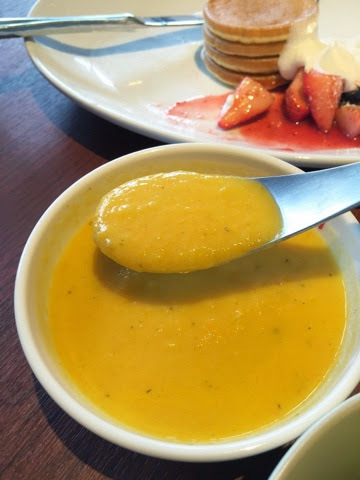 This pumpkin soup had a really thick consistency! It was also perfectly balanced between sweet and savoury notes. I really miss this hearty bowl of soup! Now I'm regretting not having a second bowl. When I first saw this dish, I felt really disappointed as it looked like something I could easily whip up at home. But my oh my, it was EXTREMELY tantalizing!!! The beef had a hint of caramelized onion and it lightly melted in my mouth with each bite. The grilled vegetables on the side were as flavourful as they were colourful. I would highly recommend this dish. To my delight, fresh pasta is available as well. Although this plate does not look attractive, the range of flavours embedded within were SO good! We were really taken aback by the taste. This cup of coffee is really light and frothy. Imported milk from Japan is used here, with the result that the texture of the coffee is easily one of the best in Hong Kong. My mum and I agreed that the latte is good on its own (without any sugar). 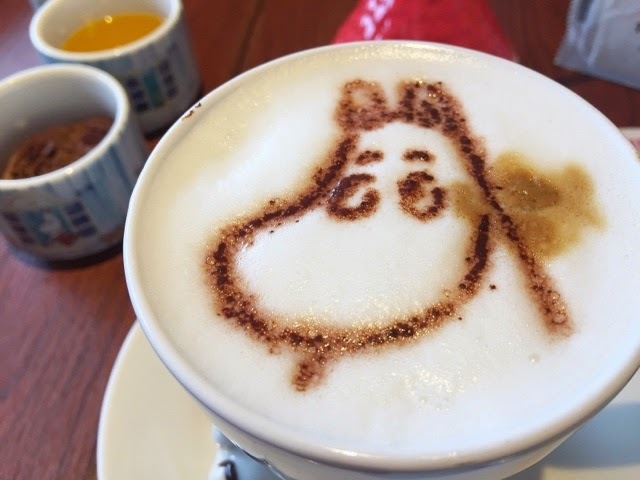 Compared to other cafes in Hong Kong, the Moomin wait staff are really polite and patient! Beyond the delicious food, the other aspects of the dining experience made it a truly memorable visit. The breathtaking view of Hong Kong's harbour and cityscape, coupled with all those adorable plush toys, makes me conclude that this is a definite must-try, even though I waited for more than an hour! 1. The cafe does not take reservations. Get a queue number from the wait staff and regularly check on the queue. 2. If you're a lone traveller, this cafe is for you because they have seats for singles! 3. 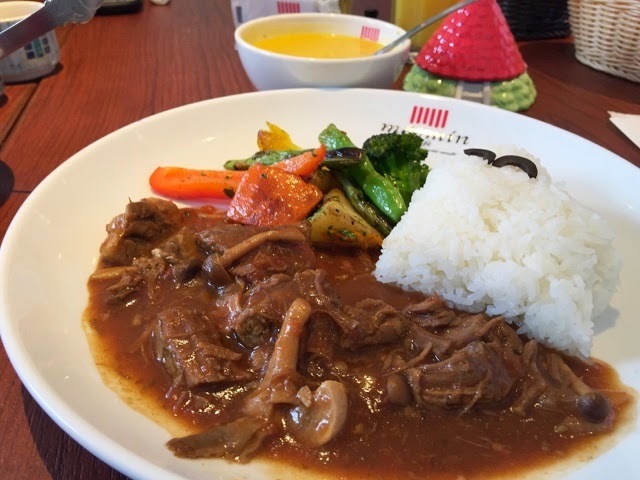 There are many shops near this cafe, so you can shop while you wait! 4. 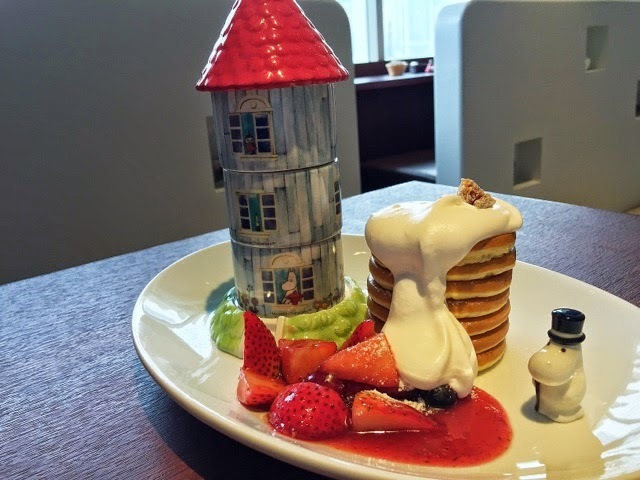 Visit after 3pm if you would like to have the Moomin House Pancakes — they are unavailable before then!